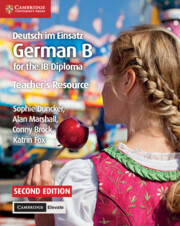 An expertly written German B course now updated for first examination 2020, providing students with thought-provoking materials to help them develop strong language skills and solid critical thinking. 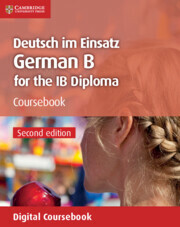 The Cambridge Elevate edition helps students develop their German language skills as they explore the five themes from the new IB Diploma Language B guide. Units begin with ‘big questions’ that get learners thinking about global topics such as, ‘how do we express our identity?’ These help students appreciate wider issues before developing their language skills through international texts and activities in the style of the exam. This digital resource allows students to annotate text, add notes and link to external resources. Answers and audio files for the listening exercises are in the teacher’s resource with Cambridge Elevate. Sections on literature give higher level students the opportunity to practice for their individual oral exam. 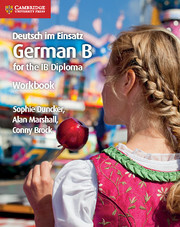 Links to Theory of Knowledge (TOK), Extended Essay (EE) and Creativity, Activity, Service (CAS) help students make connections with the IB Diploma Core. In addition, Conceptual Understanding and Approaches to Learning are integrated into the coursebook, encouraging students to improve these skills. 1. Identitäten: 1.1. Wer bin ich? 3.4. Werbung: Spaß, Verdummung oder Manipulation? 4.3. Schule – Zeitverschwendung, oder Vorbereitung für die Arbeitswelt? 6. Textsorten – Beispiele und Checklisten.